Katrina's Kreative Heart: Feed a Cold, Starve a Fever? I never could get that wives tale right? Who knows it? Please share! 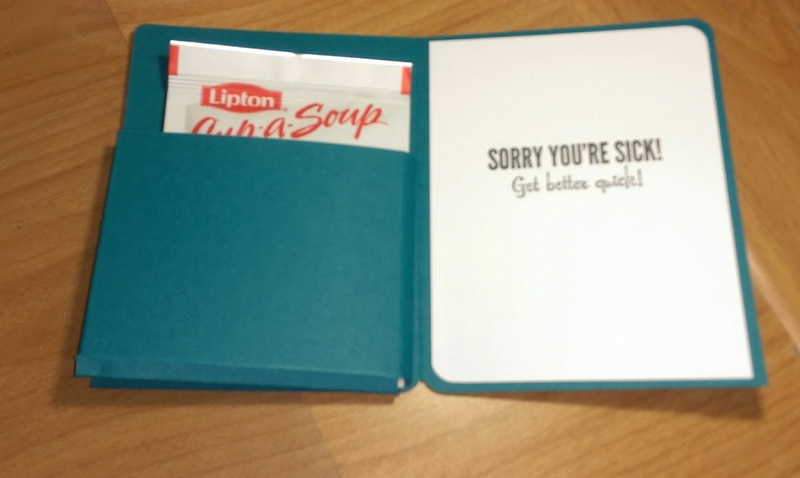 Anyway, I decided to “feed a cold” and made these cute Get Well cards. I love this stamp. It’s in the Annual catalog and is a singular wood block stamp and it makes me think of chicken soup every time I look at it so this is what I came up with and wanted to share it with you. So, I started with a sheet of Island Indigo cut to 5 ½”x8 ½” scored at 4 ¼”, I added a piece of the Island Indigo designer paper from the Regals paper pack (the paper I used is retired, however there is a new pack available with fresh designs) cut at 5 ¼”x4” and I round the 2 opposing corners, top right and bottom left of the card base and the layers. I stamped the image onto a piece of Whisper White cardstock cut at 4 ¾”x3 ½” using Momento Tuxedo Black ink pad and I masked off the heart in the center of the bowl with a 1” circle I punched from a post-it note to avoid getting black ink on it. I then colored the heart in using the Island Indigo Stampin’ Write marker, I huffed on the stamp, and stamped the image onto the white cardstock. 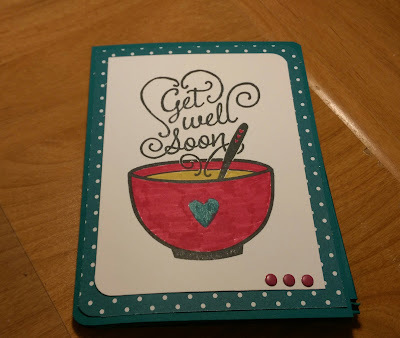 I then colored the “soup” with the Hello Honey Stampin’ Write marker and the rest of the image was colored using the Rose Red Stampin’ Write Marker. I adhered that down to the designer paper layer after rounding the apposing corners to match the others and then attached them to the front of the card base. I then added 3 Rose Red Candy Dots to the bottom right corner. 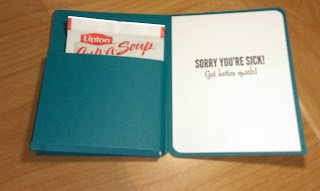 I cut a second piece of Whisper White cardstock 5 ¼”x4” and added to the inside of the card and stamped the get well sentiment from the Fabulous Four stamp set, also in Momento Tuxedo Black ink. I created the pocket for the inside front cover using a piece of Island Indigo cardstock cut at 3 ¾”x5” and scored 3 sides at ½” and ¾” using the Stampin’ Score board. I folded all of the score lines and cut away the “corners” created by the score lines, added adhesive (I used Fast Fuse, my favorite adhesive) and attached the pocket to the inside front cover. I popped a packet of instant Chicken Noodle Cup-o-Soup into the pocket and there you have it, a heart warming, cold feeding get well wish for someone special. Thanks so much for stopping by, I hope you like today’s card. Please leave me a comment and let me know what you think. Happy stamping!